Whew, there are a lot of announcements this week ;) I was going to save this one but am pretty excited to start looking for someone so here it is. 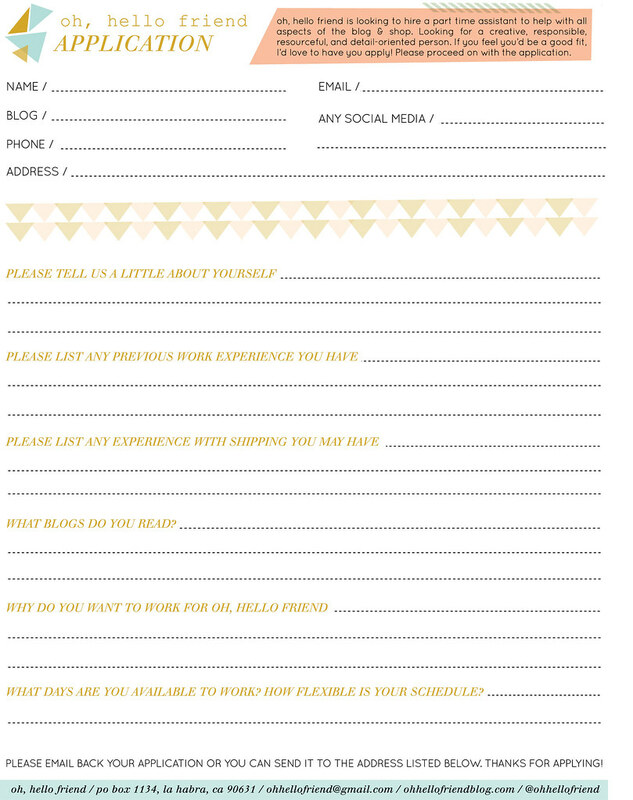 oh, hello friend is looking to hire a part time assistant to help with all aspects of the blog & shop. Looking for a creative, responsible, resourceful, and detail-oriented person. Position is ideal for a high school or college student looking for some flexible part time work. Experience with photography or graphic design is helpful but not necessary. Duties Include: Order fulfillment assistance, email correspondence with blog advertising and shop inquires, photo editing, & online shop admin. Apply: Please download an application and email it to ohhellofriend@gmail.com. You can also mail it to the address on the application. Feel free to include any other relevant information you feel would pertain to the job! Thanks friends!! :) If you have any questions regarding the position, feel free to email me. I'm sure you will find a person very fast, but just in case, I'm sure the folks at AIOC might have a few people looking for something for a few hours a week :) Plus you'd get a graphic person. Good luck!! I'm in Southern California, but unfortunately I live in Irvine... I wish! Exciting! I've been thinking recently I'd be a lot more productive if I had a part-time helper, but can't afford one yet. Hope you find someone great! @monica - GOOD IDEA! I didn't even think of that, will definitely look into it, thanks! @Sage Crown Parker - I'd love to fly down to the carribean! So close, yet so far! I live in Pasadena :( but this would have been perfect. Good luck! Is there any way I can help online? I live in Santa Monica and I can go sometimes there, but 2 a week will be to much driving and expenses for me now. I'm studying photography and I believe I can help you a lot. how nice is this! :D really looking forward about the work of you and a co-worker, it´s like a blog-family growing! :D hope you find someone great soon! :( "zut", I'm in France but it must be really great to work with you ! I can move from italy!!! Ahah i wish i could come to california!!!!! I emailed you yesterday!!! i hope you received it!! i'd love to work for you and your growing company!!! So bummed I live 1,000s of miles away! Would love to cross the ocean for this job! If you dont mind sharing, I'd love to know how this goes for you. I could so use some help and a few hours a week would be just the thing but Im a bit nervous about letting some stranger into my life like that.